(CNN) -- The organization that represents the teams competing in Formula One (FOTA) have welcomed back Williams and Force India as members, despite their suspension in May. 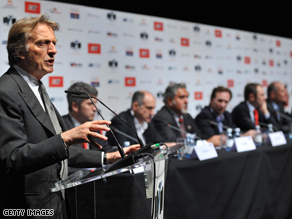 FOTA Executive Committee chair, Luca di Montezemolo addresses the group's members. The two teams had been ousted after they agreed to compete in the 2010 F1 Championship, despite opposition from other members to plans -- by world motorsport's governing body, the FIA -- to introduce spending caps for the new season. The row over the planned budgetary constraints has since been resolved -- with Ferrari, McLaren, BMW Sauber, Renault, Toyota, Red Bull Racing, Toro Rosso and Brawn GP ending their threat of forming a breakaway tournament -- facilitating the return of the two constructors. In a statement on the organization's official Web site the group confirmed: "FOTA re-affirmed that all teams competing in Formula One are able to join the association. FOTA therefore welcomes back into full membership both Williams and Force India." The three new teams who have signed up to race next season, US F1, Manor and Campos, have also been invited to join. What has Formula One ever done for us? "The Executive Committee also looks forward to welcoming the new entrants to join the association whilst they continue to prepare for next year's championship," the statement continued. FOTA also announced that discussions would take place between the teams and Formula One's commercial rights holder Bernie Ecclestone over the future of the sport. "The FOTA Executive Committee looks forward to working with the FIA and Commercial Rights Holder to promote a healthy, dynamic and sustainable sport. "To this end, FOTA intends to now enter into open discussion with the Commercial Rights Holder with the wish to confirm arrangements beyond 2012. "Furthermore, FOTA will now arrange a seminar, open to representatives of the major stakeholders (including Media, Sponsors and Promoters), to discuss how working together we can develop the show creating a more attractive spectacle for the fans," the statement added.